In what follows, I will explore some aspects of Hagiwara’s life and why he is considered the father of modern colloquial poetry. Although Sakutarō Hagiwara is mainly known for his extraordinary contribution to modern colloquial free-style poetry, the first poems he wrote at the age of fifteen followed the traditional 5-7-5-7-7 syllable tanka form. The work which introduced him to tanka poetry and compelled him to write this form of poetry was Yosano Akiko’s Tanka poetry collection Midaregami (Hair in disorder/ Tangled hair). One could say that Akiko’s work revealed poetry to be a viable way for Hagiwara to express himself. One year after he started to write tanka poetry, a composition of five tanka poems titled one night’s bond (Hitoyo enishi) was published in the Maebashi Middle School Alumni Magazine. 惓 うん じぬる里 have passed. In the following years Hagiwara kept publishing poems. In 1903, he published his first tanka in Myojo (明星, Bright Star or Morning Star), a monthly literary magazine which existed from February 1900 until November 1908 with the initial purpose to develop and promote a modernization of tanka poetry. He also contributed tanka poems other magazines: Ochiguri (Fallen Chestnuts), a Maebashi literary magazine, Bunko (Library of Literature), and Subaru (The Pleiades). Eventually, while still being a student at the Maebashi middle school, he started to write kindaishi (近代詩, modern style poetry) or shintaishi (新体詩, New Style poetry) and contributed his work in Ochiguri, Bunko and Subaru. 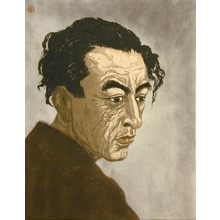 In the year 1913, three years after he had stopped writing tanka poems, Hagiwara gained recognition in the Tokyo poetry circles as an up-and-coming freestyle poet, when Zanboa (Shaddock), a magazine edited by Kitahara Hakushū, published five of his poems. This publication was his first official of free verse publication. Hakushū would eventually become Hagiwara’s friend and mentor (Hayes, 1996). あまたるきにすのにほひも No passengers yet wake. 空氣まくらの口金くちがねをゆるめて Have made the morning vile. The landscape gorge the light. Some village wall, were white. Although Hagiwara was not the first poet to break away from traditional, strictly metered poetry forms, his free-verse instigated a new epoch of Japanese poetry. His contribution to the development modern poetry was twofold. First of all, he introduced an entirely new style and established a new aesthetic by elevating colloquial Japanese language to a poetic form. He demonstrated that it was possible to maintain a sustained poetic lyricism (Gromles, 2003) “without sacrificing artistic merit” (Hayes, 1996, p. i). Secondly, he succeeded in grasping the feelings of his time “through an exploration of the murky psyche of a ‘modern’ man” (Hayes,1996, p. 10) and “the existential despair of a modern intellectual” (Ueda, 1983, p. 137). Why did Hagiwara abandon tanka poetry? What did free verse poetry offer Hagiwara that tanka poetry did not? First of all, Hagiwara rejected tanka and haiku forms because of his “increasingly skeptical attitude toward syllabic pattern as a device for creating rhythm” (Ueda, 1983, p. 171). He showed that the syllabic pattern did not create rhythm, but that rhythm originated from other linguistic elements. Free verse made it possible to bring “the inner emotive rhythm of the poem” to the fore, which was normally concealed by the restrictive form of Tanka and Haiku (Ueda, 1983, ibid.). Hagiwara’s second reason was the limited length in tanka and haiku poetry. He explained the lack of long poems through the nature of the syllabic language patterns. Write a longer poem, while being faithful to the tradition of the syllabic patterns, would leave the writer unable to avoid monotony. The only solution, according to Hagiwara, was to leave the strict rules of tanka and haiku poetry by mixing different syllabic patterns in a single poem. Free verse had the intrinsic possibility to avoid monotony and was poetically more rhythmical than tanka and haiku poetry. Thirdly, Hagiwara chose for free verse because of an extrinsic social factor. He was convinced that free verse was the only form that was capable of adequately serving the emotional needs of the twentieth-century Japanese. The traditional haiku and tanka form were insufficient to express “the vital sentiments of modern Japanese life” (Ueda, 1983, p. 173). The final factor which pushed Hagiwara to free verse poetry was “the nature of his nostalgic impulse” (Ueda, 1983, ibid.). Besides the impossibility to express the vital modern sentiments, he felt that tanka and haiku poetry did not allow him “to soar toward the far-off land of his heart’s desire” because the traditional forms were automatically read in the light of tradition (Ueda, 1983, ibid.). Free verse was, therefore, the only way for Hagiwara to express his nostalgic impulse without being imprisoned by tradition and the practices of previous poets. The ill-fate that pervaded Sakutaro’s life. “Although on the outside, I was blessed with perfect good fortune, in reality my life … has been but a succession of dark and weary pessimism …” (Hagiwara quoted by Hayes, 1996, p. 34). Free verse was the sole form that permitted Hagiwara to express himself and to articulate his fate. It was the sole form that enabled him to stage the pessimism that characterized his life. “I was born into a comparatively good home and spoiled from childhood. I was never able to constrain myself to the restrictions of others or of society. Because of my eccentric personality, from primary school onwards, I was somehow different from the other children at school and became the lone outcast, detested with cold animosity by all around me. Even now a desolate chill runs down my spine at the very thought of my school days. During those years I was hated, tormented and ostracized by all and sundry – every single pupil and teacher enough to make me wish to wreak revenge on each and every one … (Hagiwara quoted by Hayes, 1996, p. 34)”. Partly through his experiences as a child, the teenager Hagiwara became a confirmed pessimist. Besides constantly questioning the reason of his existence (note 2) his teenage years introduced another inescapable problem: an almost unbearable sexual desire (Hayes, 1996). In his essay the history of a certain man, he recounts his search for God – speaking about himself in third person: “As a youth, he was afflicted by a fearsome sexual desire. He searched for God, to turn this unbearable suffering over to him. But opening the Bible on the phrase. ‘When you look at a women lust arises in your heart…’ he closed it never to touch it again” (Hagiwara quoted by Hayes, 1996, p. 36). Ueda (1983, p. 140) emphasizes that Hagiwara’s youthful disillusionment was not a passing phase because it was “directed at the very fact of his own existence”. The root cause of his suffering, so Hagiwara believed, emanated from the affinity between fate and human nature, the instincts of the human animal let loose in the natural world, the carnal desires of the living will. He described this cause in another way by naming it ‘physiological fear’: a fear that, lying deep in one’s physical existence, continues to exert a fearful force of the individual’s spiritual and mental condition. Many of his poems share the “agonized awareness that something essential and vital within his being [physical existence] is deformed, ailing, or decomposing (Ueda, 1983, p. 142). To express this awareness, he subverted traditional Japanese imagery of beauty – bamboo, moon, cherry blossoms, chrysanthemums – by revealing their decaying, ominous and musty quality (Gromles, 2003). In The stem of grass/grass stems, he metamorphosed himself into a delicate stem of grass, while he becomes a dying chrysanthemum in Chrysanthemum Turning Sour, … Another example is the poem Rotting clam, where we find Hagiwara as a clam whose insides are decomposing. It comes as no surprise, that the ill-fated Hagiwara felt affiliated with European nihilistic philosophy (Nietzsche, Schopenhauer) and with the poems of Baudelaire, Verlaine and Mallarmé, which Ueda Bin translated in 1905 (note 3). This affiliation pervaded his poems with melancholy and nostalgia. It supported him in expressing his own fate, existential despair and anxiety and in exploring his own alienated psyche self-consciously. The poetic explorations of his dark fate resonated with the intellectuals of his age and propelled him as one of the prime innovators of modern Japanese poetry. One aspect of Hagiwara’s ideas on poetry highlighted. The dark fate to which Hagiwara felt submitted, ultimately shaped his ideas about poetry. This is most evident in his pivotal theoretical writing Principles of poetry. In this work, he argued that poetry becomes poetry through shiseishin, a poetic spirit. Poetry soars above reality. Hence shiseishin is essential romantic. Poetry seeks ideals. Hence shiseishin is essentially subjective. Poetry corrects language. Hence shiseishin is essentially rhetorical in intent. Poetry demands form. Hence shiseishin is essentially normative. Poetry ranks beauty higher than truth. Hence shiseishin is essentially aesthetic. Poetry criticizes reality. Hence shiseishin is essentially pedagogic. Poetry dreams of a transcendental world. Hence shiseishin is essentially metaphysical. Poetry demands the noble and the rare. Hence shiseishin is essentially aristocratic (antidemocratic). The aspect of reality which appears in the first and the sixth aphorism deserve a closer look. The first aphorism states that poetry needs to soar above reality, whilst the sixth declares that poetry needs to criticize reality: “In both instances reality refers to ordinary physical reality, the routine existence of an average person in the everyday world” (Ueda, 1983, p. 139). Poetry is all about fleeing reality for Hagiwara, and this flight is instigated by the presence of a poetic temperament, by which a poet finds “falsehood, corruption, and ugliness in the physical world” (Ueda, 1983, ibid). This poetic temperament, Hagiwara said, was “entirely due to fate”. For him, it was “an inborn disposition, a heaven-given nature, which is not humanly changeable. A poet is born, nor made; his fate (…) been sealed from the outset” (Hagiwara quoted by Ueda, 1983, p. 139). Poetry aims to give “expression to the inner life of a man who, because of his acute awareness of a spiritual ailment, is forever at odds with normal human existence and feels an urge to flee it if at all possible” (Ueda, 1983, p. 142). These two aphorisms reveal an important connection between Hagiwara’s fate and the fact that he felt fated to become a poet. In Principles of poetry Hagiwara seems to reformulate his ill-fate as poetic temperament. To end this text, we would like to propose the following hypothesis. Given the obvious connection between Hagiwara’s fate and what defines poetry according to him (e.g. poetic temperament), it could be that the main and maybe sole purpose of Hagiwara’s principles of Poetry was to condemn himself as a poet and to underpin poetry as his sole reason to live. The main concern of Principles of poetry seems to be the theoretical underpinning of the idea that, for Hagiwara, poetry was The answer which kept him alive? In 1917, he wrote the following: “However one considers one’s own essence, it seems that I am more correctly referred to as a ‘seeker after truth’ than as a ‘poet.’ Poetry is merely the ‘repentance of my sins.’ As a poet, I have a somewhat amateur attitude. This is because I cannot embrace a worshipful belief in poetry as the absolute (other poets-usually for superstitious reasons – tend to regard poetry as something sacred). For me, poetry is merely a ‘sad toy.’” (Hagiwara quoted by Hayes, 1996, p. 40, [emphasis added]). The fact that he saw poetry as the repentance of his own sins seems to corroborate our hypothesis that writing poetry was his only subjective answer to his ill-fate. We propose that further research should pay closer attention to the relation between poetry and the subject Hagiwara to further define the function of writing in his life. Note 1 : Takuboku Ishikawa (February 20, 1886 – April 13, 1912), Akiko Yosano (7 december 1878 – 29 may 1942) and even the father of the modern Haiku Masaoka Shiki (17 september 1867 – 19 september 1902) all tried writing poems in free verse form. Note 2: Concerning his existence he would bemoan his lack of direction, the fact that his existence was aimlessness, a sin against nature and against the very universe. Note 3: Ueda bin (1874-1916) was a poet, critic, translator of French Parnassian and Symbolist poetry and scholar of foreign literature. In 1905 he published his major work Kaichoon (The Sound of the Tide), a collection of translated western poems. Hayes, C. (1996). A Stray Dog Howling at The moon: A Literary Biography of Hagiwara Sakutaro (1886-1942). Doctoral dissertation. (unpublished). Ueda, M. (1983). Modern Japanese Poets and the Nature of Literature. Stanford: Stanford University Press. Tsukimura, R. (1976). Hagiwara Sakutarō and the Japanese Lyric Tradition. The Journal of the Association of Teachers of Japanese (Vol. 11, No. 1). pp. 47-63.